Steaks, seafood and a whole lot of blarney thrown in. Lunch Mon.-Sat.., Dinner nightly, Brunch Sun. Entertainment: Live Irish music Wed.-Sun. 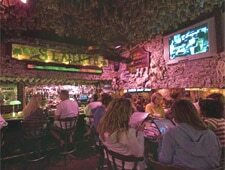 : McGuire's Irish Pub is what all those ain't-we-got-fun casual dining chains wish they could be. Inside the 20,000-square-foot facility (the city's historic circa-1927 firehouse), patrons dine in memorabilia-laden themed rooms. There's the Notre Dame Room, the Irish Links Room, the Piper's Den and the Ruprecht O'Tolf Wine Cellar. The atmosphere is New York Irish saloon on mega-steroids, with an on-site brewery and an 8,000-bottle wine cellar. If the trappings seem suited to a place for burgers and fish 'n’ chips, well, those are available (there are 25 different burger variations; you can spend an ungodly sum on one, accompanied by caviar and Champagne --- but why?). But McGuire's actually offers Prime steaks, hand-cut and flash-seared, plus lobster tail and other classic steakhouse fare. Those hankerin' for Irish verisimilitude will find a hearty lamb stew, corned beef and cabbage, steak-and-mushroom pie and shepherd's pie. The "Irish Fisherman's Bouillabaisse," filled with fresh Gulf fish and shellfish, is always a good choice. Also located at 33 Harbor Blvd., Destin, 850-654-0567.